As winter draws closer many home owners wrongly believe that they’re doing the environment a favour by running a gas or electric heater, rather than a wood heater. Gas and electricity production continue to be the leading cause of greenhouse gas emissions in the world whilst wood heat gets unfairly targeted in the media.Whilst the impact of wood heating is visible for all to see in the form of smoke, it makes everyone who uses it instantly accountable. People who heat with electricity and gas seem to be off with the pixies when it comes to real impact they have having on the environment.Their push button convenience seems to somehow negate them from the pollution they have caused because it’s not in their backyard and they can't see it! The pollution however is much more devastating though as it’s been caused further upstream in the refineries and during transport. While some users give wood heating a bad name, there are hundreds of thousands of responsible home owners who burn wood well with minimal pollution. Always run the heater on high for the first 20 minutes after reloading: This is because wood goes through 3 main phases of heating when it burns and needs to be on high to reduce the possibility of the wood not igniting effectively. Do not overfill the heater: There must be enough space for the air to move down the glass and into the base of the fire. Use plenty of dry kindling to establish the fire quickly: It is important to get the fire warmed up as quickly as possible to avoid excess smoke caused by inefficient ignition of the gases coming off the woods heated surface. Establish a good fire quickly: When flames get close to the cold surface of the metal firebox the flame is cooled too much and the fire will simply go out. Use smaller logs to get the fire established and larger logs once the fire is established: Using smaller logs allows the flame and hot gas to circulate through the wood quickly. Ensure there is 2cm gap between each log: This allows air to get into the hot area of the fire leading to better combustion. 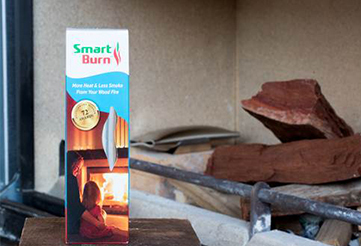 Add a SmartBurn: This technology helps to reduce smoke emissions by up to 50% whilst increasing the fires efficiency. Keep the heater in good working order: The flue and heater should be checked annually. With wood heating on the rise in Australia due to the climbing cost of electricity and gas it is always important to remember it is a low cost and low carbon way to heat homes.Those who use wood as a renewable heat source should feel proud of their efforts.You are not relying on fossil fuels for heat and are achieving energy independence. Whatever fuel source you choose, its use will have an impact on the Environment. The good thing with wood however, is that its pollution can be managed and minimized.